An ambient dance track gets the Mix Rescue treatment this month, as SOS reader Mark Edwards finds out that less is definitely more. I was intrigued by this track when it was sent to us by SOS reader Mark Edwards, as it was the first electronic instrumental track we'd had in for a Mix Rescue and I really liked some of the sounds and textures Mark was using. 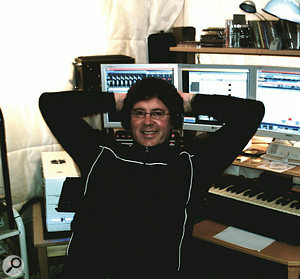 His piece, 'New Horizon', has a very simple, mainly monophonic, piano motif as the lead line supported by a fairly chilled drum groove, a simple synth bass part and several different types of pad that drift in and out throughout the piece, including a Mellotron sample, or similar, some bowed bass strings and a few reversed sounds. I liked the feel of Mark's mix, but at the same time thought that it had a rather squeezed, congested sound, and that it might benefit from being opened out a little. The piano recording was given an ethereal, 'trippy' quality using a software emulation of Roland's RE201 Space Echo. 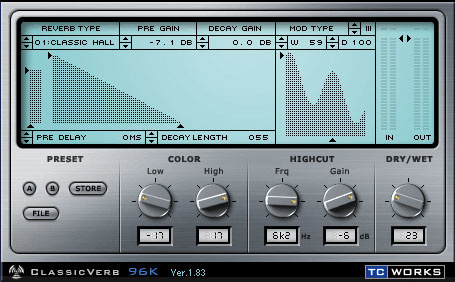 A further echo/reverb treatment was then applied with a TC Electronic Classicverb algorithm. My first impression was that the piano part wasn't flowing as well as it might, and as this was the only part sent to me as a MIDI file, I checked it and found that there was no sustain pedal in use. All the other files came as audio, some with processing already added. To smooth out the piano, I set it up using a Steinway sample, then extended all the notes to make the sound flow more. Where there were consecutive notes, I used Logic 's facility for preventing consecutive similar notes from overlapping. I also moved one or two notes very slightly to make the timing seem more relaxed. To give the piano a dreamy, almost 'trippy' feel, I added some light compression, and then used Universal Audio's UAD1 Roland RE210 Space Echo plug-in to add simulated tape echo, and followed that up with the TC Electronic Classicverb to provide a bright, spacious echo/reverb combination. A light dusting of low-cut filter at around 350Hz lightened the sound further, so that it just floated over the rest of the mix. As I had the MIDI file for the piano melody, I also experimented by finding a vocal pad sound on the Wavestation (courtesy of Korg's Legacy Collection), then passed this through a flanger and added reverb, mirroring the piano part at an almost subliminally low level. I brought this in around a third of the way into the song, so as to introduce some dynamics and to enhance the sense of mystery. Mark Edwards plays guitar and bass in two bands, and also has a studio ('The Pod') in Portishead in Bristol, where he makes abstract and ambient electronica inspired by Brian Eno, William Orbit, Enigma, and Debussy. Mark had created his drum part using the excellent Spectrasonics Stylus RMX plug-in, which drove the track along nicely, but to me it sounded a bit too polite, so I dirtied it up a little using Logic 's Distortion plug-in, and then used some 100Hz low-cut filter to kill a little excessive low end. Mark had also recorded some little Stylus RMX rhythm fills on a separate track, so I used the Noveltech Character plug-in to lift these out of the mix a bit more. The other Stylus RMX rhythms he'd used just at the start of the song and again at the end were left as they were, other than having their levels automated. The other part that I felt was too clean and tidy was the synth bass line that Mark had called Bootbass. Again I used a distortion plug-in to fluff up the sound a bit, then passed the result through a low-pass filter to stop the high end getting too rough. Not quite Leftfield, but heading in the right direction! I felt that treating the drum and bass parts in this way gave the track a more contemporary feel, and at the same time gave the piano line more space to breath at the high end of the spectrum. It's rather like the effect of creating a photograph with the background slightly out of focus in order to enhance the clarity of the main subject. That sorted out most of the key elements, but now there were all those pads to deal with. One part called Marbles comprised a steamy filtered synth sound with a bit of a vintage sci-fi quality to it, but I wanted to thin it down while at the same time make it more interesting. To this end I passed it through Logic 's EVOC20 filter bank with some gentle modulation to add movement, then used my old trick with the tempo-locked panner to get it moving side to side eight times per bar. 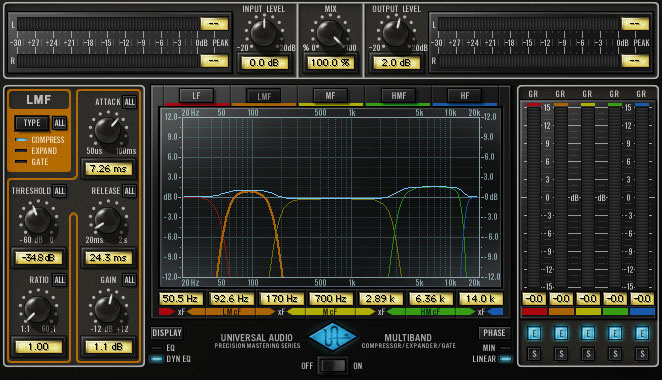 Here you can see how Paul used Universal Audio's multi-band mastering compressor to give a final polish to the completed mix.I left Mark's Angel Pad as it was, but dropped out a couple of sections near the middle of the song to allow some of the other elements to come to the fore. I also muted a small section of the Mellotron strings and bowed bass strings just after the middle section to introduce some lightness before the mix built up again. I also used some low cut and gentle mid-range boost to take some of the depth out of the bowed bass strings, as I felt they were conflicting with the bass synth part a little too much. To fatten up the orchestral strings in the mid-section, I passed them through the Roland Dimension D plug-in, added reverb, and then rolled out a little low end to prevent the lower mid-range from going muddy. Another pad part, that Mark had called Angel Filter, was treated to flanging and low cut to make it more breathy, but most of his other parts were left pretty much as he'd sent them, except that I automated their levels where necessary to keep the mix sounding balanced. He'd included some tracks of cymbals, reversed cymbals, tambourine, shakers, and maracas, and these were balanced up and with a little reverb to give them a sense of distance. With this kind of music, I feel that it's useful to try to create an illusion of front-to-back perspective as well as left-to-right, and combining more reverb with lower mix levels is one way to achieve this. Where pads were playing at the same time, I tried to pan these to opposite sides (but not too extremely) to create a wider soundscape. Of course, the rhythm and bass parts were kept pretty much central, as was the piano. I tried a number of different reverbs, and found that the choice wasn't too critical as long as the reverb didn't have too much low end. With music of this type you can get away with reverb times of a little over two seconds if you keep the reverb sound thinned out and don't add too much. Cascading delays and reverbs can also be very effective. Mark's original mix of his track 'New Horizon', as sent to us. My remixed version of 'New Horizon'. Mark's original Stylus RMX audio part. 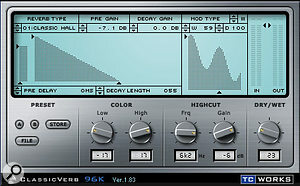 The Stylus RMX audio part with mild distortion and low-cut filtering. The Marbles pad part as supplied. Marbles pad with added EVOC20 filtering and eight-per-bar panning. The original orchestra pad part. The orchestra pad with Roland Dimension D chorus and low-cut EQ. The Angel pad in Mark's version of the mix. The Angel Filter pad with flanging and low cut EQ. Another short, swirly synth sound used only on the intro was treated to some slow but deep flanging to make it sound even more other-worldly than it already did. By the same token, the short Angel Filter part in the same section, which had a reversed feel, was given some additional Space Designer reverb and panned to the opposite side to the other pad playing at the same time. The only part I actually added to the mix was a sample of an African shell rattle being shaken, once during the low-key intro and again right at the end. I also copied one of Mark's reversed cymbals to punctuate the point at where the melody starts. 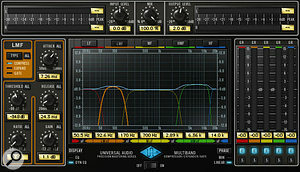 To add a bit of gloss to the mix, I tried out the new UAD1 multi-band mastering compressor at a low-threshold, low-ratio setting and with the mid-range pulled down slightly to add punch and to increase clarity. This was followed by the TC Electronic Brickwall Limiter to pin those peaks and the job was done. Obviously, with a track like this that is so abstract in nature, there is no single right way to mix it, but I felt that I'd certainly arrived at one of the possible right ways. I think I succeeded in getting a bit more space and air into the mix and also in sorting out some conflicting frequency issues. The mix now had a little more light and shade in the arrangement, and, overall, I was quite pleased with it. As ever, I have more flexibility when all the tracks are sent to me without processing, but all things considered, I felt this worked out pretty well. Mark Edwards: "Composing and producing my own music has taught me many things, one of which is the need to stay objective. It was with this in mind that I contacted Mix Rescue. When I received the new version of my track, the first thing I noticed was how much more 'open' it sounded. The introduction in particular had given me some trouble, but it now sounded sharper and much more effective. I then noticed that the piano sounded better and was more prominent. In fact, each instrument seemed to have its own space. I had not listened to my original mix for a while, and when I did an A/B comparison I quickly came to the conclusion that less is more! "Paul has done a great job and I have learnt so much from this experience, which will help me when I mix the tracks for my new collection."